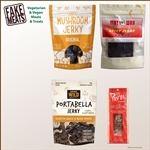 FakeMeats.com has the best selection of vegetarian jerky and vegan jerky. Great on-the-go, high-protein vegetarian and vegan snacks and meat substitutes. Try a variety of flavors, or buy a whole box of your favorite jerky flavor to stock your pantry! Find your favorite Fake Meats vegetarian jerky flavor today!